Your home might be one of your most valuable possessions, and you want to maximize the value of your investment. An unfinished basement not only represents unused living space, it detracts from the overall value of your home. Cossentino and Sons can turn an unfinished basement into an extension of your home – a gathering place for family and friends. There are a variety of options we can address when working with an unfinished basement – the possibilities are virtually endless. The space can easily be subdivided, and framed out so you gain new rooms that are designated for a particular use. In addition to framing out the room, we will address issues such as HVAC and ductwork, along with the right type of doors, trim, and paint. We begin our unfinished basement projects with a meeting to determine how you would like to live in the new space. Are you looking for a place to watch movies and enjoy music or are you thinking about a playroom for the children? 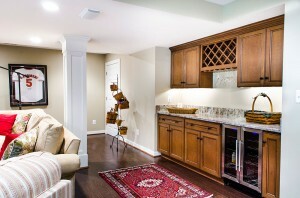 Do you envision entertaining friends with a custom bar? Whatever you want, Cossentino and Sons will create your custom basement as an extension of your existing home. Think of it this way – your basement represents 1/3 of your total living space. Doesn’t this space deserve to be every bit as beautiful and functional as the rest of your home? After this meeting, we will provide you with a proposal. If this proposal is within your budget and you would like to begin the process, we will then provide you a detailed Contract Proposal for your approval. Cossentino and Sons will file for the proper permits. You will not have to worry about involving yourself with this – we know what to do, and we do it the right way. The basement remodeling construction stage will begin with an actual outline of the envisioned space on your existing unfinished basement floor. 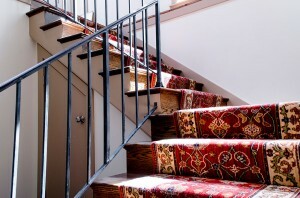 We have found that this process has greatly helped our homeowners to visualize their new space. Of course, making changes to these plans is no problem. Throughout the project, our professional employees will treat your home and property as if it were their own. They keep the workspace clean and haul away debris and other materials at the end of the day. We dedicate ourselves to staying on schedule, so you can take advantage of your new custom basement as soon as possible!